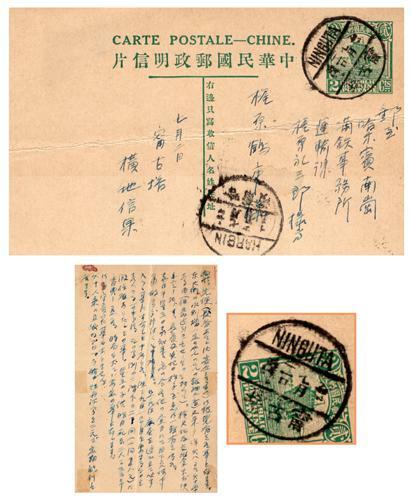 1928 (Jul 2) ROC Junk 2c Postal Card from Ninguta to Harbin, tied by rare Ninguta bilingual cds., along with Harbin arrival. Card with creases. VF-F.
1928 (Sep 29) ROC Junk 2c Postal Card from Takushan to Denmark, via Siberia, uprated by Junk 4c, tied by Takushan bilingual cds., along with Antung transit. VF-F.
1907 (Nov 24) Newchwang to Kalgan registered red band cover, franked on reverse CIP 5c & 2c, tied by Moukden Newchwang cds., along with vertical type Newchwang registered cachet. On front with the same registered cachet. VF-F.
1909 (Aug 31) Moukden Newchwang to Tsinan registered red band cover, franked on reverse CIP 2c and 5c (stamp off), tied by Moukden Newchwang cds., along with Peking transit. 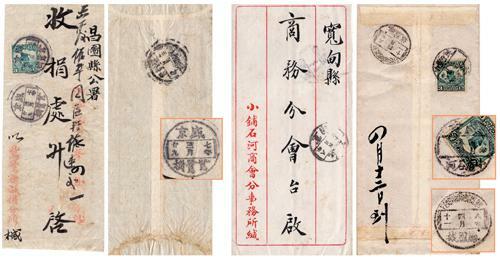 On front with vertical type Newchwang registered cachet and post office's slogan cachet. F-VF. 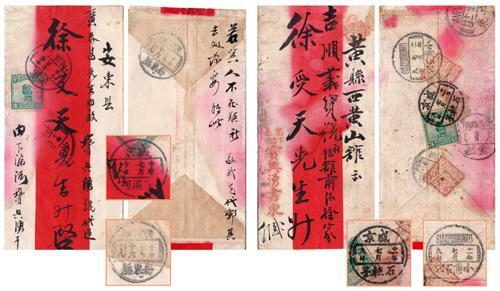 1912 (Mar 30) Kirin Imienpo registered to Tientsin red band cover, franked on reverse CIP 3c, tied by Kirin Imienpo cds., along with Imienpo registered cachet, Harbin transit and Tientsin arrival. 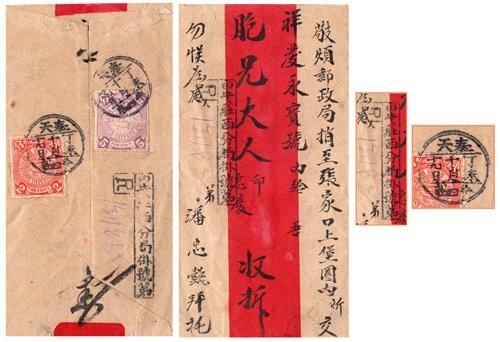 1910 (May 4) Changtufu registered to Peking red band cover, franked on reverse CIP 4c & 10c, tied by Changtufu cds., along with Changtufu registered cachet, Fengtien transit and Peking arrival. VF-F.
1932 (Jan 13) Pingyangchen to Harbin registered cover, franked on reverse Junk ovpt. "Limited For Use in Kihei" 4c × 2 & 1c × 2, tied by Pingyangchen cds., along with Harbin arrival. On front with Kirin Pingyangchen registered cachet. VF-F.
1924 (Sep 14) Moukden to Changtu registered cover, f.w. Junk 8c, tied by Moukden bilingual cds., along with Moukden registered cachet and Changtu arrival. VF-F.
1921 (Mar 9) Moukden to registered Changtu cover, franked on reverse Junk 1c & 13c (stamp off), tied by Moukden bilingual cds., along with Moukden registered cachet and Changtufu arrival. VF-F.
1915 (Apr. 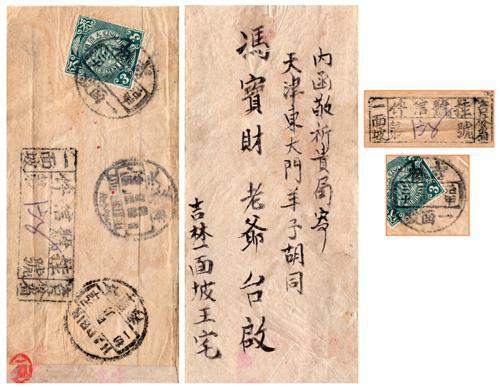 17) Fengtien to Heishan registered cover, franked on reverse Junk 8c, tied by Fengtien bilingual cds., on front with Fengtien registered cachet. 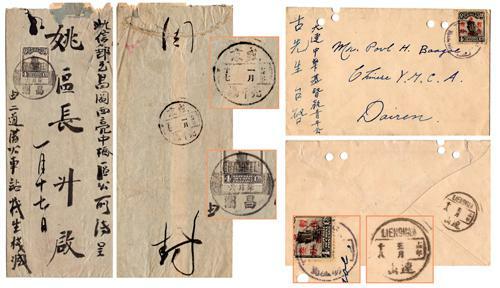 VF-F.
1927 (Jun 18) Harbin to registered Shanghai cover, mixed franking with Junk 1c, and Junk ovpt. "Limited For Use in Kihei" 4c × 4, tied by Harbin bilingual cds., along with all English Harbin registered cachet. On reverse with Shanghai arrival. VF-F.
1922 (Jul 14) Antung registered Express to Tientsin red band cover, on reverse mixed franking Junk 3c × 4 and commemorative issue 1c, tied by Antung bilingual cds., on front showing Moukden Antung registered and Express cachets, Tientsin transit and arrival. 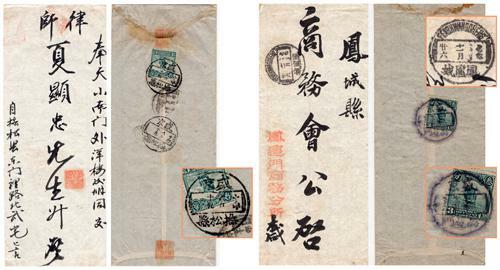 VF-F.
1918 western style insured cover from Tientsin to Mukden, franked on reverse Junk Issue 16c x 2 & $5 x 2 (one with fault), tied by Tientsin bisected cds. Fengtien arrival on front. Rare usage of $5 stamp on cover. 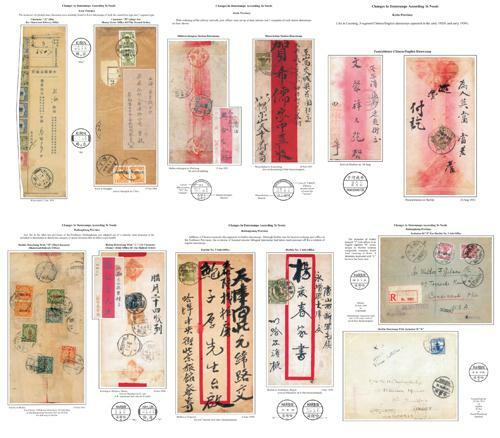 1910s-1930s a One Frame collection of 31 ROC covers and one receipt, all bearing Manchuria small town postmarks, mostly franked with Junk issues, showing rare and interesting town cds. Need viewing. 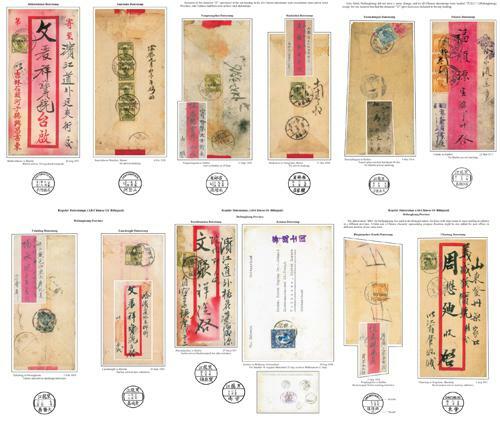 1910s-1930s a One Frame collection of 25 ROC covers, postcards and 5 receipts, depicting the "Changes In Datestamps According to Need" in Manchuria. Very interesting. Please view. 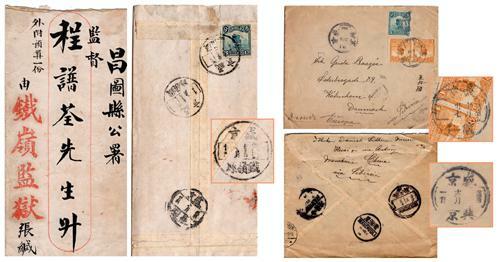 1913 & 17 two Manchuria covers, one from Moukden to Changpaifu, f.w. CIP ovpt. ROC 1c, tied by Moukden cds., bearing Tunghua, Linchiang transits and Changpaifu arrival; another from Fangshanchen to Heishan, f.w. Junk 3c, tied by Fangshanchen cds. A nice pair. 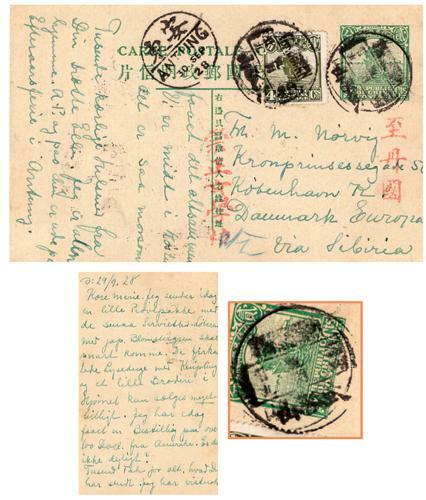 VF-F.
1915 two covers with Shenking postmarks, both f.w. Junk 3c. One from Liaoyang to Haicheng, tied by Shenking Liaoyang cds., bearing Haicheng arrival; another from Moukden to Chenan, tied by Moukden cds., bearing Shenking Chenan arrival. VF-F.
1917 & 18 two covers with Shenking postmarks, both f.w. Junk 3c. One from Lichiawopao to Chenan, tied by Shenking Lichiawopao cds., bearing Chenan arrival; another from Hsiaopeihe to Liaochunghsien, tied by Shenking Hsiaopeihe cds., bearing Liaochunghsien arrival. VF-F.
1918 & 21 two covers with Shenking postmarks, both f.w. Junk 3c. One from Fusunghsien to Changtufu, tied by Shenking Fusunghsien cds., bearing Moukden arrival; another from Kaolimen to Fenghwangcheng, tied by Shenking Kaolimen cds., bearing Fenghwangcheng arrival. 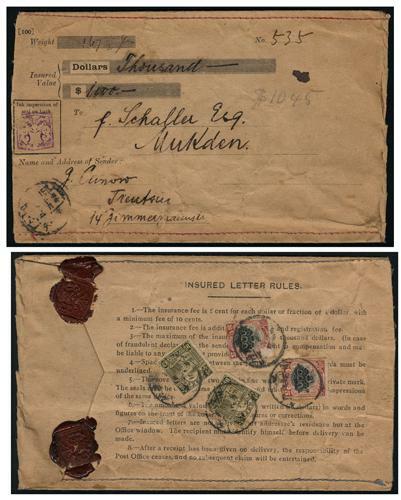 VF-F.
1918 & 21 two covers with Shenking postmarks, both f.w. Junk 3c. One from Tzelushu to Changtufu, tied by Shenking Tzelushu cds., bearing Changtufu arrival; another from Shenking Hsiaopushihhe to Kwantien, bearing Fenghwangcheng transit and Kwantien arrival. VF-F.
1921 & 22 two covers with Shenking postmarks, both f.w. Junk 3c. One from Hsialouho to Antung, tied by Shenking Hsialouho cds., bearing Shachientze transit and Antung arrival; the other from Shihchutze to Hwanghsien, tied by Shenking Shihchutze cds., bearing Hsiaopushihho, Antung, Chefoo transits and Hwanghsien arrival. 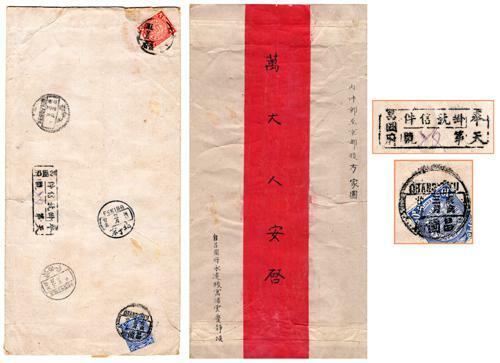 1922 & 1924 two red band covers with Shenking postmarks, one from Hsiaochengtze to Changtu, f.w. Junk 1c × strip of 3, tied by Shenking Hsiaochengtze cds., bearing Kongchuling transit and Changtu arrival; the other from Nuerhho to Tientsin, f.w. Junk 3c × 4, tied by Moukden Nuerhho cds., bearing Shanhaikwan transit and Tientsin arrival. 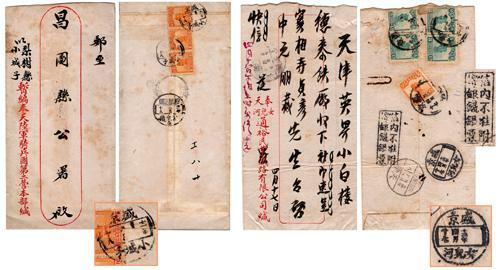 1922 two covers with Shenking postmarks, one from Shangchiaho to Hingkingfu, f.w. Junk 3c, tied by Shenking Shangchiaho cds., bearing Hingkingfu arrival; the other from Hsiaochengtze to Changtu, f.w. 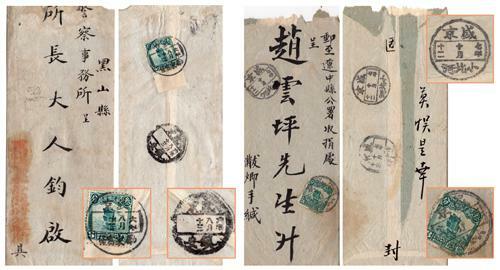 Junk 1c × 2 (one stamp off), tied by Shenking Hsiaochengtze cds., bearing Kongchuling transit and Changtu arrival. 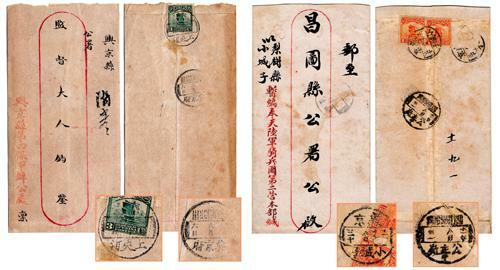 1926 & 1925 two covers with Shenking postmarks, one from Changtu to Liangchungchiao, f.w. Junk 4c, tied by Changtu cds., bearing Shenking Liangchungchiao arrival; the other from Hulutao to Talien, f.w. Junk surcharged Temporary For 3c, tied by Shenking Hulutao cds., bearing Lienshan transit. 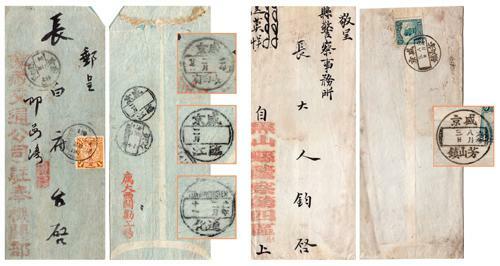 1910s-20s two covers with Shenking postmarks, one from Tiehling to Changtu, f.w. Junk 3c, tied by Shenking Tiehlinghsien cds., along with Changtu arrival; the other from Shenking Huaijen to Denmark, f.w. 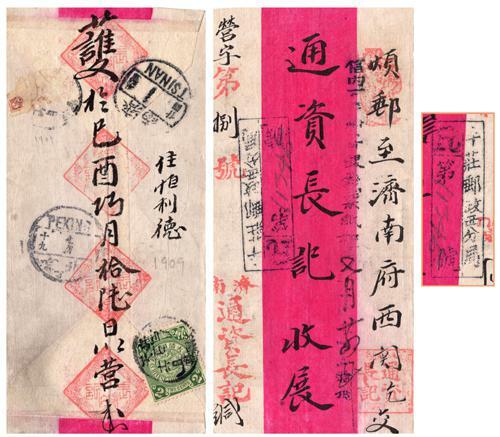 Junk 3c × 1 and 1c pair (one stamp off), tied by Shenking Huaijen cds., bearing Hingking, Moukden, Harbin, and Manchouli transit and Denmark arrival.